A Book Review for You: A Book Review for Early American Dollhouse Miniatures (Paperback) 4 Out of 5 stars. A Book Review for Early American Dollhouse Miniatures (Paperback) 4 Out of 5 stars. 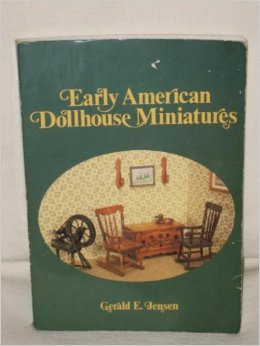 Early American Dollhouse Miniatures (Paperback) by Gerald Jensen, June 1, 1981 First Edition. My Review: Dollhouse miniatures are a fascination in my household. I had to say that outright in order for my review to be evenly weighed. I bought this to add to my miniaturist book collection. Perhaps, in time it will be useful for one or two items I might construct, but for now, it isn't for me. This is an interesting read for those interested in Early America. If you are into miniatures of Early America, this book isn't bad. Be forewarned, 98% of the book is black and white photos: there are only about a dozen color photos. It is an old book from 1981 and poorly constructed. Again, for this time period, there are lots of diagrams for making this period of items for your dollhouse, shop or diorama. I give it four stars for the wealth of information in it. Overall, not a bad book. It just isn't for me.